Generally, the meat or fish was cooked, boned, cut against the grain, then pounded in a mortar with salt, pepper, and spices, such as mace, nutmeg and cloves. 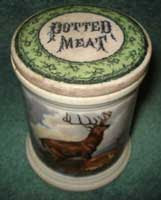 In 1817 Kitchiner wrote "...to make Potted Meats smooth there is nothing equal to plenty of Elbow-grease." It should be the consistancy of paste or "like dough" [E. Smith] Once cooled, the mixture was firmly pressed into a potting pot and sealed from the air with a layer of clarified butter. The pot was covered with paper, sheet India rubber, or a bladder tied securely in place and stored in a cool dry location for months. Earlier recipes for pounded meats (or pieces) put the mixture in hard pastry shells to be served. By mid 1600’s some pots were mentioned. Price’s The Complete Cook, 1681 suggested the paste cover an earthenware pot. With the advent of pots, the potted food could be sent “... to table either cut in slices or in the pot.” [Farley] “If you want to turn it whole out of your pots, butter them well before you put in the meat.” [Briggs] An attractive slice was “Potted lobster or Crab” by Kitchiner made by layering lobster pieces, coral and spawn. Glasse wrote that "...a slice of this ['potted Cheshire Cheese'] exceeds all the cream cheese that can be made." In addition to being served during the meal, potted foods could be used to thicken soups, to make sandwiches, for those unable to chew their food and for travelers. Potting was not always a foolproof way to store food. Glasse included a recipe "to Save potted birds, that begin to be bad... [and] that no body could bear the smell for the rankness of the butter.."
The potting pots were earthenware or fine china. Receipts specified sizes from small to large, and round or long. Perhaps the finer containers were for immediate use on the table, while the earthenware served for long term storage. China was r eplaced by various types of glazed pottery, produced in large numbers in northern England, into the 20th century. A charming specialized shallow pot contained char, [photo from Fitzwilliam Museum] a fish from the Lake District of England, while the taller, lidded one with a picture of a deer contained potted meat. Rub a piece of lean fleshy beef, about three pounds in weight, with an ounce of saltpetre powdered, and afterwards with two ounces of salt; put it in a pan or salting tray, and let it lie two days, basting it with the brine, and rubbing it into it each day. Then put the meat into an earthenware jar, just large enough to hold it, together with all the skin and gristle of the joint, first trimmed from it: add about a pint of water, put some stiff paste over the top of the jar, and place it in a slow oven to bake for four hours. When it is done, pour off the gravy, (which save to use for enriching sauces or gravies,) take out the gristle and the skin; then cut the meat small, and beat it in a mortar, adding occasionally a little of the gravy, a little fresh butter, and finely powdered allspice, cloves, and pepper, enough to season it. The more you beat and rub the meat, the better, as it will require so much less butter or gravy, which will assist it to keep the longer; but when potted beef is wanted for present use, the addition of gravy and butter will improve its taste and appearance. When it is intended for keeping, put it into small earthenware pots or into tin cans, press it down hard, pour on the top clarified butter to the thickness of a quarter of an inch, and tie over it a piece of damp bladder.